For the week of September 28 through October 4, we're going to take a look at some classic series including Zelda and Kingdom Hearts, a sleeper hit called Uplink, Burger King's foray into Xbox gaming, and South Park. 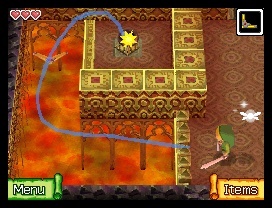 On October 1st just one year ago, The Legend of Zelda: Phantom Hourglass made its way into the long list of Zelda games, this time for the DS platform. With glowing reviews across the board, the game was praised as a joy to play, and setting a gold standard for implementation of the touch-screen interface. Phantom Hourglass has performed rather respectably in the marketplace, with last reported records showing 4.13 million units being sold to date worldwide. Going back a bit further in time in our time-traveling box, we reach the year 2001, and the debut of a quiet little cyberpunk hacking game called Uplink. Introversion Software went on to publish a couple more games, including the recently released Multiwinia, a game of 'stick-man slaughter'. Joe Blancato waxed nostalgic over Uplink in The Escapist Issue 13's "Someday I'll Hack the Gibson" article back in '05, calling for a massive multiplayer version. Uplink was later released in 2006 on Valve's Steam service. Proving that October 1 was just a big day for games in general across all platforms, in 2004 Verizon Wireless debuted a Kingdom Hearts game designed exclusively for its V CAST service in Japan. It would reach the United States in early 2005, and was met with decent reviews. In 2006, Burger King announced an innovative videogame promotion featuring three Xbox/Xbox 360 games available for purchase with a BK Value Meal: Sneak King, Pocketbike Racer and Big Bumpin. While the food was undoubtedly better than the games, the creepy styled Sneak King pulled out ahead of the other two titles to become a cult hit among gamers. IGN commented, "It's hard to say that Sneak King isn't worth picking up", noting for a $3.99 advergame it was just hilarious enough to merit a purchase. While it had been leaked originally much earlier in the year, Burger King waited until the top of October to make an official announcement. The offbeat promotion was a success, with Burger King announcing that between the three titles, two million copies had been sold in four weeks over the 2006 holiday season. That's a lot of fries. Two years ago on October 4th, the South Park episode "Make Love, Not Warcraft" aired, adding such colorful terms such as 'r-tard' and references to Hello Kitty Island Adventure to chat channels for weeks afterward. Some obsessive players went so far as to analyze the Sword of Thousand Truths used in the episode, noting it to be a match for existing epic item "The Hungering Cold." The episode went on to win an Emmy Award for Outstanding Animated Program (For Programming Less Than One Hour). Incorporating extensive use of machinima, the episode was "filmed" over the course of a few weeks on an alpha server for then-upcoming WoW expansion The Burning Crusade. At present, there is a player achievement in the upcoming Wrath of the Lich King expansion named after this episode, requiring the player to emote /hug on a dead enemy before they release their corpse. Wrapping up the week, we also celebrate the anniversary of the debut of the PlayStation in Europe (September 29, 1995), and the October releases of Project Gotham Racing 4 (2007), Enemy Territory: QUAKE Wars (2007), Maniac Mansion (1987), Zak McKracken and the Alien Mindbenders (1988), and The Secret of Monkey Island (1990). Research Manager Nova Barlow notes if she had a TARDIS, she really would use it to travel around to great moments in videogaming history.